If there ever was a flower which symbolized glorious summertime, the sunflower is the one. Did you know that nearly all of the 70 species of sunflowers are native to North America? They can grow to be up to six feet tall and they even tilt as the sun moves so they always face it! 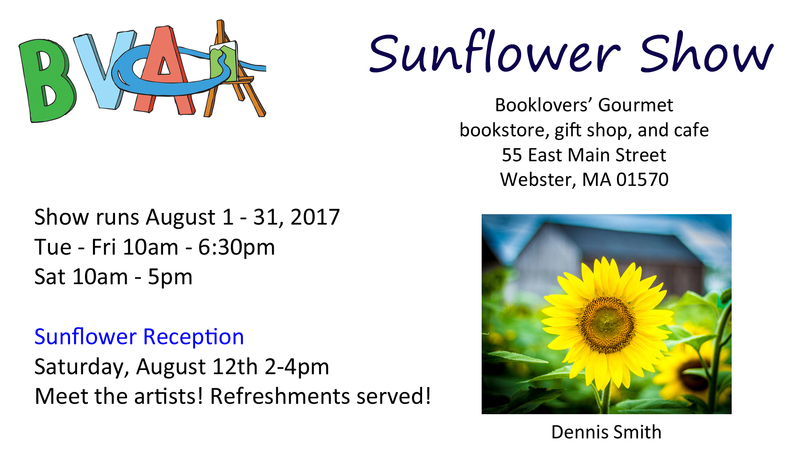 The Blackstone Valley Art Association is celebrating this sun-shaped delight with a sunflower show throughout the month of August at the Booklovers’ Gourmet in Webster. Our show complements the massive garden of live sunflowers which the bookstore is famous for. Come on out to admire the live flowers, appreciate the artistic versions, and explore the shop’s offerings! The drop-off for the Sunflower Show is Saturday, July 29th any time before 5pm. The shop will take care of hanging the items. The reception will be 2-4pm on Saturday, August 12th. Pick-up for the show is Thursday, August 31st, any time before 6pm (during their open hours of course 🙂 ). This show is all about sunflowers! The Booklovers’ Gourmet is well known for their beautiful sunflower garden, which will be in full bloom during the show’s run.